Mammoth Hunters of the last Ice-Age, their legacy, and "World Surveyor Man". About 75,000 years ago, the super volcano under Lake Toba in what is now Sumatra blew up in such a spectacular explosion that its effects and debris can still be found over most of the planet. The massive amounts of dust blown high into the atmosphere blocked the sun's rays and caused the whole planet to plunge immediately into an ice-age lasting more than 60,000 years. For weeks after, it rained sulphuric acid. There were massive extinctions. The early human population also plummeted. It was the more resourceful humans up to the challenge, that survived. In India, recently excavated stone tools, show that the makers were "modern" humans with a technology that enabled them to survive the dust, after effects and climate changes. In Indonesia, they took to their boats. We don't know when boats were invented and first used, since they were always made from organic materials that rarely leave any trace. We do know that early humans in what is now Indonesia must have used boats. During the ice ages, when most of the moisture in the atmosphere was bound up in the massive ice-caps and glaciers, Indonesia, which has the earliest dated remains of definite human ancestors - to 2 million years ago (found in east Java), was part of south-east Asia. Most of its islands were joined together along with what is now Malaysia, Borneo and the gulf of Thailand, Sumatra, Java, Bali - this lost part of Asia is called Sundaland. It was separated from the continental plate of Australia - which included Papua New Guinea by open seas, peppered with islands like Sulawayo, and Flores. Some islands like Flores, as well as the Australian continent are separated by deep sea trenches marking the edges of boundary plates, which even in the most severe ice age remained as open seas and since this was on and near the equator, never froze. During the ice ages, in this region, the rain forests became less dense, but the living was still easy compared to the northern parts of the world. People may have reached the shores of northern Australia as much as 120,000 years ago - and even during an ice-age, this part of the world was separated from south-east Asia by seas wide enough to keep Australia's wild-life and vegetation unique. Early humans would have had to cross open seas to some of the Indonesian islands too - since because of the deep ocean trenches it did not all become dry land. Flores was first colonised by Homo Erectus perhaps as much as a million years ago - certainly more than 200,000 years ago - and they had to take themselves and family across open sea, with hungry sharks, and hungry crocodiles, and difficult sea currents to get there. Unless they had a sturdy boat to protect them, they would never have made it. Exploding vocanoes might have given the inhabitants of this part of the world the challenge to develop the technology to take to the sea. Though fortunately not always of the scale of Toba, the world exploding behind you would have been a powerful incentive to take to the boats - invent them if you didn't have them yet, and head for a more peaceful land. And with the boats comes more technology - and knowledge to be passed on. Navigating by the currents, the sea-birds, the winds, the position of the sun, and the stars at night. As well as the skills to make a leak proof vessel and move it safely to another shore. And survive with fresh water and food. Some of the traditional skills that enabled people to cross the Pacific and colonise even tiny islands have survived. Until the last ice age, the early humans struggled to survive during the ice-ages. They either managed to migrate further south - or they died out. In south-eastern Britain then linked to what is now Germany by "Doggerland", the ancient Brits either migrated to Spain or the South of France or failed to survive. New immigrants turned up in the north, thousands of years later when the climate warmed up. Here is a description of Neanderthal life in what is now the English Midlands, and then possibly as far north as humans in Europe are known to have lived at the time. In Siberia it would have been more difficult for these early humans to escape the cold. There were great glaciated mountain ranges between them and a tropical paradise. However not all northern Asia, that is Siberia, was covered by ice. Being such a vast land mass, rainfall or snow is low, the land is dry and the ground is frozen. In the last ice age, the frozen Arctic ocean blocked the mouths of the great Siberian rivers, so they backed up and formed huge frozen lakes. Diring Yuryakh would have been on the banks of such a lake formed by the River Lena. The map has the locations of some modern towns to show the locations. It shows the southern boundaries of the great ice fields, the glaciers over the mountains, and the great lakes formed by the iced up rivers. It also shows possible paths of human migration. And they are into the north, as well as to the east and across the north Pacific into America - and west into Europe. This time humans were no longer defeated by the cold weather, they had developed the technology - clothing, housing, food collecting skills, to be up to the challenge. Palaeolithic sites abound in North-Eastern Siberia even up to the shores of the Arctic Ocean. The people who lived them were primarily mammoth hunters. They have been blamed for the extinction of the mammoth. But mammoth did not die out completely until as late as 4,000 years ago. And it was also the climate change which replaced much of their mossy tundra with grassland which also left them to adapt or die. The nearest surviving relatives to the mammoths are the Asian elephants still living in India, Thailand etc. - which were mostly domesticated. Mammoths were once so plentiful, their bones are still easily found today. When the spring thaw comes and the ice breaks up and rushes down the river to the sea, the mammoth remains get washed out of the ancient permafrost where they had breathed their last. Someone showed me a mammoth tooth they had found on the beach near the Lena pillars. "What do you think this is?". "A mammoth tooth" I said. "How do you know?". - She suddenly remembered I was a historian not a zoologist. "Can you think of any other animal round here that would have a mouth big enough for teeth that size?" - It was about the size of a brick. Mammoth tusks are still carved into little ornaments. This modern ivory carving is legal (despite being a limited resource) as even if the mammoth was killed by humans (and many show signs that they were), it was a long time ago. You can buy an authenticated mammoth ivory shaman, or mammoth as a souvenir. But these carvings are nothing like the beautiful filigree caskets that were made in the 18th and 19th centuries, which can now be seen in museums. The ice-age mammoth hunters had such a advanced culture, that until improved means of carbon dating from the 1960s on, it was firmly believed until carbon dating was available to indicate how long ago they lived, that these were neolithic people living after the ice age. It was assumed, despite increasing evidence that they were wrong, that no one could have lived in this northern region - and therefore emigrate to America before the end of the ice age. The Dyuktai site by the Aldan River, was originally thought to have been occupied by people ancestral to the the American Clovis culture of about 12,000 years ago, which was believed to have been the earliest people in America. This is now known not to be the case - there are sites in South America dated to as much as 35,000 years ago and apparently inhabited by people much like the early Australians - so they probably had come by boat across the north Pacific. The Dyuktai people lived from 33,000 to 10,000 years ago. There are similar sites with similar tools of similar age in Yakutia. 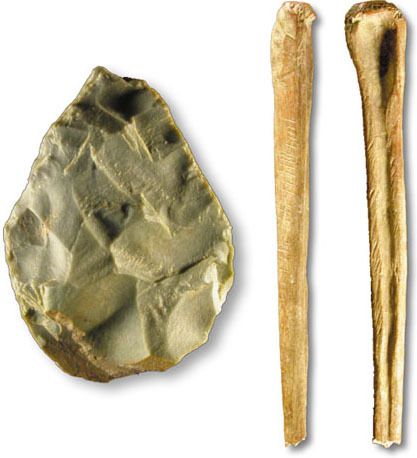 The tools are not identical to those of the Clovis. During the last ice age, the chains of islands across the North Pacific formed an almost continous coast line. It was actually warmer there than today, since the Bering straits were continuous land between Chukotka and Alaska. It was frozen tundra, inhabited by animals like mammoths, but any route into America was blocked by the massive ice shield over the north of the American continent. The land of Beringia though did block off the worst of the cold Arctic winds from the Pacific Ocean. Passage to the shores of California and beyond was made even more easy by the direction of the ocean current that way. So it was less easy to return back again to Asia. And why should they when they reached the warmer lands by the California coast and beyond. Not only genetics but similarities in legends, culture etc. reveal origins from Siberia. But these were later - at the end of the Ice Age and later. The earlier immigrants to America appear to have come from South-East Asia and resembled the remaining earlier populations of that part of the world, like the Ainu from what is now Japan - then linked to the mainland, and the Austro-nesians from South-East Asia - then part of the Asian continent as Sundaland. The Ainu (in the Far East on the shores of the North Pacific) are related to the Basque people (in the West on the shores of the Atlantic) by language and appearance. Their ancestors, appear to have spread outwards from central Siberia - and some traces of related languages have been found although nearly extinct, such as Saami. The mammoth hunters had a similar cultural life style from central Europe across south Siberia, and up the Lena valley, in north-eastern Siberia, and across the North Pacific into America. Ice-age settlements dating back around 30,000 years have been found in the Yana river valley a long way above the Arctic Circle, and at a time when the climate was colder than it is now - the tools used bear a similarity to those found in America. The mammoth hunters are ancestors not only of native Americans, but of Europeans. This has been confirmed not only by the comparisons of similar stone tools, but by mitochondrial DNA testing and other biological genetic tests. Y-chromosome DNA testing of men in a village near Oxford, indicated that European men had originated in South Siberia some 40,000 years ago. Their ancestors were also the Siberian mammoth hunters. It was also discovered that the Welsh people had Siberian ancestry from about 30,000 years ago, and they had a common ancestry from Siberia as the Basques - who had retained their own language, whereas the Welsh had acqired a Celtic language later. Further Y chromosome testing carried out recently shows a recent common ancestry of Caucasoid and Native American Y chromosomes, and a close identification of the latter with the Siberian Altai (of the South Siberian Altai mountain region) and of the Ket (all that survives of the original population by the Yenesei river). Evidence for settlements along the coasts of North America would have been destroyed, as all the coastal land sank and flooded after the ice age. Since settlements have been dated to around 35,000 years ago in South America, the continent must have been colonized much earlier. The Mammoth Hunter culture stretches from the Atlantic coast (and may even have reached North East America that way) across central Europe and South Siberia, and dates from about 55,000 years ago - when the physical type was still the rugged "Neanderthal" - to about 15,000 years ago - when the great mammoth herds were a thing of the past and the ice-age was coming to an end in rapid climate changes. Mammoths lingered on - much reduced in size from the giants of the ice-age, on isolated islands in the Arctic and North Pacific to as late as 4,000 years ago when even these were hunted to extinction. We can talk about a "mammoth-hunter culture" because although there are many differences over such a vast period of time - there is clear evidence of interaction, trade routes, and the sharing of ideas. From about 55,000 years ago to about 15,000 years ago, the mammoth hunters are distinguished by their yurts built of mammoth bones. During that time their physical appearance changed from the rugged Neanderthal type to the more modern type like ourselves. This was part of the process of neotony. It is the process found in domesticated animals like dogs and cats. It is the retention of juvenile characteristics. In this case we were domesticating ourselves with our improved technology. We did not improve physically. We became less robust and strong. Our faces are flatter, our noses thinner so our sinuses more likely to get bunged up, our mouths smaller, so we get impacted wisdom teeth, and our teeth have weaker roots so they are more likely to rot. And also our brains shrunk to two-thirds of the Neanderthal size. Shortly before birth, the modern human foetus loses lots of brain cells. What we have lost is much of our innate senses - our ancestors were far more in tune with their environment. The architecture of the yurts improved until 15,000 years ago, they were neatly constructed with the bones fitted together in patterns. Society seems to have developed too, with larger villages and the yurts arranged along streets. And with a ceremonial lodge as a main feature. Still today, the sewing needle is a prized possession for women living in remote parts of Siberia. Many of the needles discovered were of bone, rounded in cross section with sharp points and a small eye for the thread. These were not likely to have been used with fur and leather. You need something harder with a triangular cross section to pierce holes in leather without splitting it. 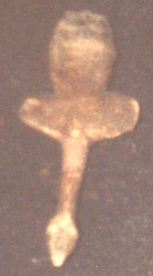 The bone needles indicate woven clothing, which is also indicated on the little mother dolls. Also they could be used for tattooing which is also indicated on the little figures. Woven linen was a technology which was not beyond them at all but we should be very lucky to find any trace of it surviving in an archaeological site. And much of the weaving equipment would be perishable too, wood. But some bone artifacts which have been found might have been used for some kind of weaving or knitting and for spinning and preparing the material which could have been from sources like nettle fibres, or hemp. Leather probably had holes drilled round the seams ready to be stitched with needle and thread - which could be spun from animal fibres like sinew (reindeer sinews were used until recently) or vegetable fibers. The drilling of holes in the needles, as well as the huge number of drilled beads that were found indicate another new technology - the bow drill. This was also used to make fire. And although it could take 20 minutes to get a fire going - it was at least a reliable method. One that was in the domain of the housewife. So much so, that the hearth was in the control of the housewife and in Siberia women shamans are called "Udagen" or "fire" or "hearth" woman. And a female spirit controlled the fire. The bow drills were themselves regarded as sacred objects. However they were of perishable materials so did not last long. The mammoth hunters discovered preserved in frozen tombs, dated to around 25,000 years ago, wore clothes made of fur and leather, tailored and sewn and decorated with embroidery, beads and fringes. They wore jewellery, tattooed and painted their bodies and dressed their hair in elaborate braided styles. They also decorated their homes, and many objects both for use and for their religion. Workshops have been found where bead making has been concentrated, and other manufactures - showing specialization and trade. When the mammoth hunters first arrived in Europe from Siberia, about 30,000 to 35,000 years ago, they brought with them a far more advanced technology and culture to the native Neanderthal population. Although the Neanderthals at the time were not far behind, this new culture was far more advance in so many ways that the European Neanderthals were from that time history. This is referred to as the Aurignacian culture and sites have been across Europe as well as in Siberia. These perhaps represent the first wave of "modern" European settlers as can be traced in the Y chromosomes of European men as originating from South Siberia. They did not yet have the fine bone needles which indicate they would have had woven clothing and sewn water tight boots and watertight skin boats. They did have lots of decorative jewrellry, beaded and decorated clothing and since they also painted pictures over cave walls, probably painted and tattoed bodies. The site recently excavated by the river Yana was inhabited from about 19,000 years ago to about 18,000 years ago. At the coldest period in the last ice age. As it is at latitude 70.72 (longitude 135.42) it is well beyond the Arctic circle, and would have been near the edge of the Arctic ice. It was not covered by ice and snow though - because of the extremely dry climate, only the ground was frozen. And in summer they were able to enjoy continuous sunshine. Winters were cold dark and miserable. They must have had hearth fires, oil lamps, and warm waterproof and windproof clothing. Also the technology to store food for the winter months. (The picture shows one of the stone tools and part of a carved wolf bone). The next wave of migrants into Europe from Siberia from 28,000 to 22,000 years ago is called the "Gravettian culture". This is also traceable in the Y chromosome indicating orgins of European men as from South Siberia. Not just more advanced in technology, but also in trading relations and cultural and some kind of political relationship with other peoples. This is shown by the little portable "mother" figurines found at such mammoth hunter sites from across Europe, France, Czech Republic etc. and in South Siberia itself. 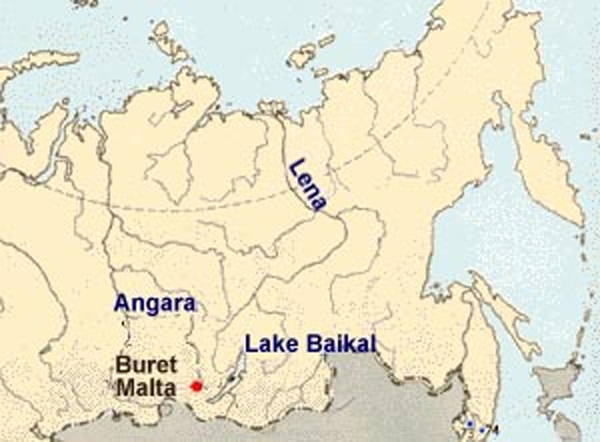 The development of this culture can be found in sites in south Siberia such as those of Mal'ta and Buret. Finds from the mammoth-hunter yurts excavated near the Angara River (especally Mal'ta and Buret) can be seen in the museum in Irkutsk. The sites date to about 24,000 years ago. At Malta, there were large and small round houses, partly dug out of the ground (as homes were in the north until into the Iron Age) and built with a low wall of stone and then roofed over with mammoth bones, reindeer antlers etc. - which would have been covered with mammoth hides. At Buret, the people lived together in large dwellings - several families together. There were three hearths in each - one in the centre, and one either end. Crawling on hands and knees a distance of 12 or 15 feet through the low doorway, we entered the large open circle in the interior of the tent. A crackling fire of resinous pine boughs burned brightly upon the ground in the centre, illuminating redly the framwork of black glossy poles, and flickering fitfully over the dingy skins of the roof and the swarthy tattoed faces of the women who squatted around. A large copper kettle, filled with some mixture of questionable odor and appearance, hung over the blaze, and furnished occupation to a couple of skinny bare-armed women, who with the same sticks were attentively stirring its contents, poking up the fire, and knocking over the head 2 or 3 lazy dogs. The smoke which rose lazily from the fire, hang in a blue, clearly defined cloud about 5 feet from the ground, dividing the atmosphere of the tent into a lower stratum of comparatively clean air, and an upper cloud region where smoke, vapours and ill odors contested for supremacy." In winter the Koryaks lived in wooden houses, which since the sides became covered with snow, were entered through the chimney on the roof. These half-underground winter houses were once used right across the north - and Father Christmas still comes down the chimney by the traditional winter entrance. In England you still find iron blades up the chimney - to ward off the spirits who still enter the house by that traditional means. 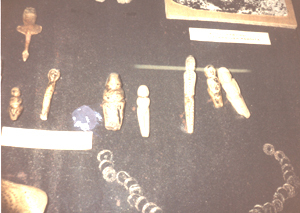 A display in the museum in Irkutsk (photo taken by Heather Hobden Irkutsk museum 1983 - had permission) shows the finds from the excavations made near the Angara River. At one of the three hearths of the long house, were found "mother" dolls together with bracelets, headbands, pins and spatulas (which could be used for applying makeup). This is easily interpreted as the women's quarters, especially as at the hearth at the other end, was found weapons, tools, jewellry and small ivory images of phallic looking swans - made to wear as pendants. Such swan pendants were also found in the tombs of men. In the showcase of the finds from the sites of Mal'ta an Buret - and similar to finds in tombs (in the lower corner of the photo), is a mammoth bone (from a scapula) plaque. One side is drilled with holes forming an elaborate pattern of spirals, the reverse has three zig-zag water serpents. The drawing shows what both sides look like, the small photo shows one of the sides. Mother images - of a protective maternal deity - have been found right across the mammoth-hunter area. Artistically they vary. Some are very abstract and sophisticated. The mother figurines near the Angara River are mostly naturallistic. They show real women, with braided hair styles, tattoos or body paint, saggy breasts, and in some cases clothing - a fur onesie or jumpsuit - much as was still worn until recently by the Chukchi and Koryak women in the North Pacific regions. These could be interpreted as protective "mothers" for childbirth, hunting, the home, the tribal territory, the earth and land itself, etc. We can say this because the concept is still with us. We still personify qualities with sturdy female images - Justice, Britannia, Liberty, Marianne, Mother Russia, etc. And there is a long tradition of mother goddesses between. Clearly many iconic beliefs still held today were already well established some 25,000 years ago. The plaque in the Irkutsk museum has a hole through its centre - it may have been attached to a shaman's ceremonial dress or hang up in a special place. Spirals are traditionally associated with the heavens. And zigzag water serpents - sometimes just abstracted as zig zags or diamond patterns, sometimes elaborated into fiercesome dragons, are associated with the underworld - and femaleness. You can see such imagery on Chinese paintings and on European paintings, and in traditional Australian cosmic imagery too. It is interesting that spirals are associated with the heavens long before anyone knew about galaxies (only since 1930) but it reveals that 25,000 years ago careful observations had been made of the patterns of nature - the winds and clouds, and the ripples over the water. The phallic swan pendants. (photo taken in Irkutsk museum by Heather Hobden). As the "mothers" are female power so these represent the mysterious qualify of "male power". The "seeds of life" that men thought they possessed having noticed that women did not get pregnant by themselves. So the Swan also represents life, and came also to represent the rising sun which brings life and light. More explicit pendants of phalluses with wings were worn by men for good luck in the iron age - there are a number in the museum at Scunthorpe. The constellation of Cassiopeia is the double-headed eagle - the goddess who confers ruling powers to man on Earth. 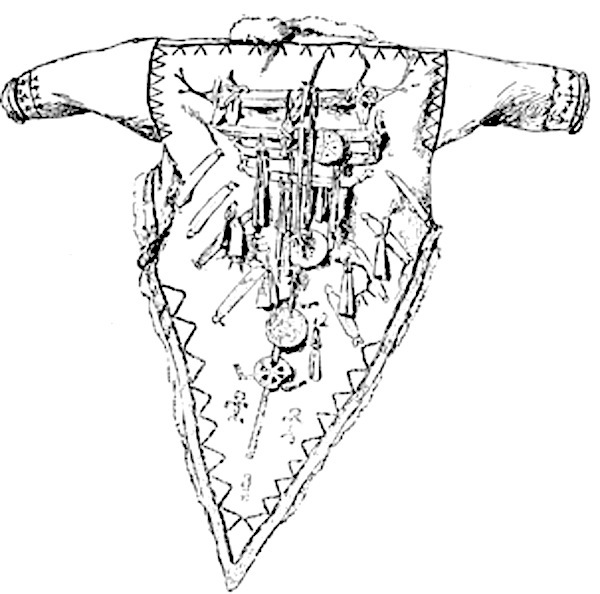 The picture shows the pendants of double headed eagle and swan on the Ket shaman's coat as seen below. The constellation of the Great Bear is represented by a female pregnant Elk - more on this later. The constellation of Cygnus - the Swan - is a swan. This image has remained constant. 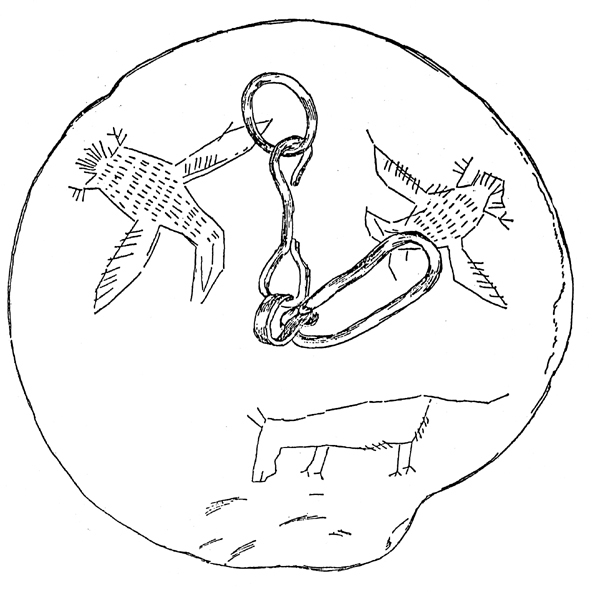 A Yakut shaman's pendant in the museum at Yakutsk, shows the circumpolar constellations. The pendant is 19th century, but the iconography is much older. The position of the north celestial pole changes slightly as the axis of the Earth describes a circle over about 26,000 years - never going back exactly to the very same place. It does mean though that it is possible to look at ancient images of the circumpolar constellations and date them to some extent. And also representations of these constellations important at the time. At present the crucifix-shaped Swan is not entirely circumpolar at the latitudes of South Siberia and Northern Europe. It dips partly below the horizon in the autumn, rising again in the spring. At the time of the pendants near the Angara River, the Swan would have been circumpolar - overhead. The Milky Way goes through this constellation - and behind it appears to divide into two (we now know this is due to dust clouds obscuring the stars near the centre of our galaxy). This has led to stories about the ski-tracks of the Swan Prince - also called World Watching or World Surveyor Man, as he watches over us. Not just swans but other water birds are associated with light and life and the sun - cranes, geese and ducks - and this iconography is still to be found across Europe and Asia. In the Neolithic and Bronze Age (from about 7,000 years ago)the water bird-like male sun god appears in Eastern Europe and China on a conveyance to get him across the sky - a wheeled chariot drawn by ducks or geese or similar. Typical of these is the "Duplijaja chariot" now in the museum in Belgrade. When the figure on the chariot is lifted off it can be seen that not only is he definitely male under his skirt, but he is standing over an inscribed cross within a circle. The cross-circle or wheel is an icon of the sun and its passage through the year and through the day. Wheels have been found dated 24,000 years ago placed in the tombs at Sunghir in Russia - another mammoth hunter culture where the clothing of fringed leather embroidered with beads (much like that worn later in Siberia) survived in the permafrost conditions. Wheels like this one carved out of mammoth ivory had been carefully laid in tombs. 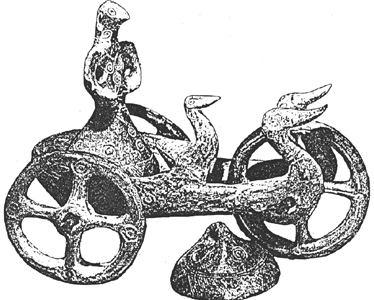 Wheels however are not known to have been used for transport that early. 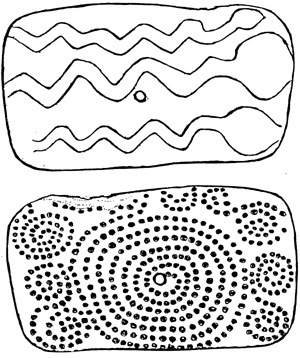 Wheels are also sun emblems in North America - they are on the rock drawings of the Chumash of California for example. One of the oldest crosses was found inscribed in red into a piece of polished mammoth ivory found in Hungary dated to around 100,000 years ago. The cross in circle was a Roman symbol of the Sun God and transfered into Christian iconography. 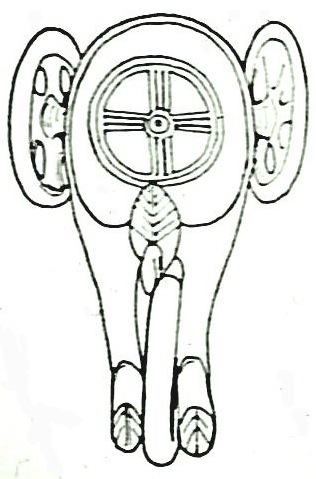 Wheels were part of the charms worn by Siberian shamans to show the Earth - a pierced disc - the sun - a copper disc, moon, sun the underworld (a crescent), the circumpolar stars which surrounded the hole through which the shaman ascended to heaven, and a wheel represented the sun. The iron or copper pendants were attached to the coat. (Before metal was found these would have been of ivory). and the shaman also wore a crown with reindeer antlers. 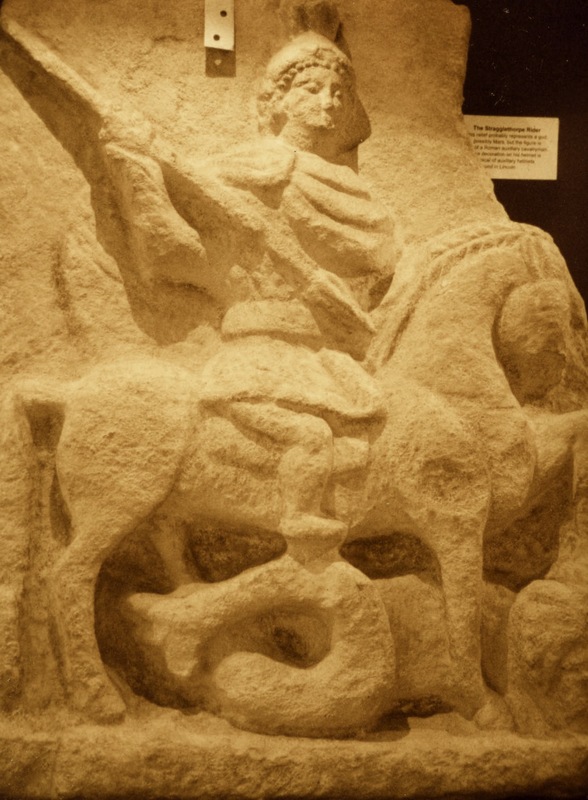 The picture is of the "Stragglethorpe Rider" which was part of a frieze uncovered at Straggethorpe. It dates to the Roman Occupation of this area and could be called "Iron Age". The Roman era temple was destroyed and replaced by a Saxon Church, dedicated to St. Michael - whose image is shown with wings and killing a dragon. Images of St. George also derive from the same god or similar. Not far from Stragglesthorpe is Bayards Leap - at a cross-roads. There are three sets of horse-shoes - at least one of which is still maintained and is at the corner of the cross roads where there was once a cafe and garage. And leaflets were sold giving the legend of Bayards Leap. The story of a farmer, returned from the war who found the land blighted by the spells of an evil witch who had once been his beautiful girl friend. She and her two children lived in a cave. On his blind horse Bayard - the farmer tried to kill the witch and her children, but she clung to the back of Bayard who leapt three times to shake her off and kill her. Then the sun started to return and the land started springing to life and crops started growing. A similar story (there are many versions) is also found explaining winter and the return of spring - across the North Sea in Northern-Eastern Europe and Western Siberia, which have or once had, Finno-Urgrian populations - the same people who also inhabited Eastern England. Recent excavations at Stragglethorpe have revealed the remains of a Neolithic circle and a number of Bronze age burials. And excavations not far away have revealed stone tools dated to about 13,000 years ago, at the end of the ice-age, before the North Sea flooded, when reindeer hunters followed the herds north to their summer pastures. The Swan Prince in the Iron Age (from about 500 years ago in Northern Europe and Siberia)was now mounted on a white horse. His association with "male power" is obvious as he is dressed and armed as a warrior. His curly golden hair streams out - he may be shown with a halo. He still has wings. (Or wing like billowing cloak). He carries a long sword or a long lance with which he is spearing a serpent monster or dragon. The association with the constellation of Cygnus the Swan is seen in the legends associating the god of light and life with a role in leading the souls of the dead to the world of the dead, across the milky way (or Pebbly River). (A North American Menomi story says that babies always have holes in their little moccasins so they can say they cannot travel the road of the dead as their shoes are too bad). This role of leading the souls of the dead to the place of the dead, was Christianized as Saint Michael (Swan wings, big sword, dragon)- and the transition can be seen in the church at Stragglethorpe in Lincolnshire built over a previous religious site from which the relief of the Stragglethorpe Rider (wings, horse, armour, lance, dragon) was uncovered. The Swan Prince was also Christianized as St. George (horse, wing-like billowing cloak, lance into dragon). George means farmer, and this is linked to legends like the one at Bayards leap where a farmer and soldier returns - marries a witch and leaves his bride who turns the Earth desolate (winter), lives in a cave and has two cubs (survival of bear imagery) - and when her husband returns he kills her and cubs and life and light return. At Bayards leap he is on a blind horse - Bayard - and the horses hoof prints (preserved by horse shoes although only one set of the three has now survived) are the prints of the horse as he leapt to throw and kill the witch. 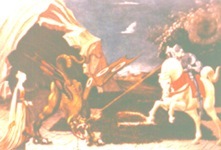 This imagery can be seen in the 15th century painting by Uccello - even the spirals in the sky over St. George - the light and day - the cave behind the dragon, who is bleeding, and held by a woman - obvious female imagery facing the big lance of George. The Yukaghir women in North East Siberia also wore a "George". A big shiny medal - called a "chest sun" on the front of their aprons - this showed a rider with lance on a headless horse (spirit horses often headless). It is a clue to the possible origins of the Yukaghir and their links to other populations. "World-Surveyor-Man" also leads the Birds away each autumn - in the legends of Siberia and Northern Europe, to the World of the Birds. (The sun and the birds leave Earth for the winter). He led the birds along the milky way to the edge of the world where the sky meets the ground. Here they clash together and the birds must fly through while they they are open. In spring, the Swan Prince leads the birds back to Earth. Many do not make it safely through the crushing edges of the world, and the ground below is red with the crushed corpses of those who got caught. The Yukaghir - numerous in the 18th century but now almost extinct - are the survivors of an earlier population in Europe, Siberia and North America. The sort of rituals and beliefs that may have existed at Stragglethorpe (and have been brought by Roman mercenaries from Eastern Europe) survived in the Ural mountains. These people - the Mansi - originally Vogul - had been part of a Hungarian empire - of which some tribes emigrated in the 10th century to what is present day Hungary. In 1232 King Bela IV dispatched Dominican friars on a mission to convert the folk left behind. By the time the sole survivor, Julian, of the expedition arrived, he found them preparing for battle against the Mongols under Batu Khan and Batu Khan's envoy - who was English, warned the friar that the Mongols were on their way to conquer the entire world. Julian had to rush home to warn his King, and the Pope in Rome. The Mansi/Vogul retained their original beliefs. To them the Sun God, was the younges of the seven children of the Sky God Num-Taremand the Great Mother Goddess Juli-Tarem. He was called Mir-Susne-Khum - which translates as World Watching Man or World Surveyor Man. He was also called "the Golden Prince watching over the people"
His myths are similar to the Bear myths. He was sent by his father the Sky God to bring cultural benefits to man. He suffered and was badly treated but had his revenge. He will return again in time of trouble to help man. This seems to been a common messianic belief. The Ket - last survivors on the River Yenesei of many similar tribes ancestral to many Europeans and North Americans, believed that their hero Alba, son of their creator God Ets, would return and save them. They wait. The Mansi made the sun God's image in copper or brass as a goose - or rather since male, gander. In his bird form he watches over the world to ensure health and happiness and bright light to the Earth. The Aurora Borealis is caused by his shiny clothes and glittering white horse as he flashes through the sky. The sun's rays are his long hair "When the Golden Prince undoes his locks of hair the ice melts on the rivers". "Due to the power of his hair we have summer, we have winter." Shamans received their magic powers from World-Surveyor-Man while in a trance. The shamans were said to live in the sun's rays "like insects in human hair". The Mansi believed that one of their five souls lived in their hair. They deprived enemies of this soul by scalping them. Golden-Prince, Prince with the rising sun's rays"
let the golden rays of the Sun appear!" Similar prayers were made by the Saxons to the rising sun. As the Bear was symbolically killed and resurrected, so was a similar sacrifice made for World Surveyor Man. But it was a man who was killed. Such rituals survive in traditions like the Haxley Hood. and the Plough Plays. A man was sacrificed at the beginning of winter representing the death of the sun (we still burn effigies on bonfires at the beginning of November). Real human sacrifice continued in the North East of Europe into the 19th century. Here the victim (often a slave bought for the purpose) was cleaned up in the sauna, then brought by the elders and shamans into the sacred wooden lodge with its life size idols with silver beaky nosed faces and lifelike staring eyes. The shamans killed the victim by gouging out his eyes and ripping out his tongue - he had to suffer badly as part of the ritual. They laid the dying man on a wooden butchers table and cut him up. The joints were placed in a big iron cauldron and cooked. When done, the meat was placed in an great wooden trough and eaten. What remained was laid out for the god. Human sacrifices were also made to celebrate special occasions - if this was to seal a political treaty one of the warriors would be selected. The Siberia hub page with references, links, and other relevant information. The beginning of Siberian history. Part two of Siberian history. From ice-age mammoth-hunters and their legacy to iron age. Time Before Clocks. Has more on time in Siberia. Siberian calendars and timekeeping included in this. Chukotka and the directions of time. More on the directions of time and space - includes significant directions in Yakutian cosmology and Evenk time-keeping. Shamans and Time. Has more about the religion and the shamans. Yakutia in the 16th and 17th centuries. Yakutia in the 18th century Part One..
Yakutia in the 18th century Part Two.The Billings Expedition.